There are a few kinks in it, something to be expected in a 1.0 release, but for anyone who knows QuarkXPress, could never get to grips with Flash and doesn't want to be a coder, QID could be just the program you're looking for. Think of Quark and you'll think of QuarkXPress. There's a reason for that: for years, Quark has been a one- product company. That's not for the want of trying. Quark has tried numerous times to break out of its page-layout software niche and into packaging design, interactive new media content and so on with various other products - all of which have crashed and burned, generally through being overpriced and not very good. Remember Quark Immedia? Quark really wishes you didn't. 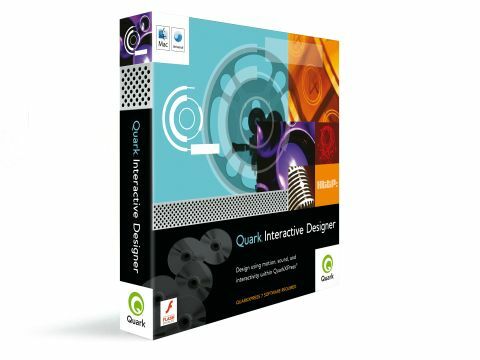 But now the company has Quark Interactive Designer for QuarkXPress, an add-on for QuarkXPress 7 that allows designers to create interactive presentations and websites from their layouts. The idea behind this is simple. QuarkXPress has been around for nearly two decades and has a fantastic array of tools for creating layouts that nearly every designer in the world can use. So, how about letting those designers use its capabilities to create layouts, and then provide a tool for making them interactive? Better still, why not allow them to export that interactive content as standard Flash movies, rather than, say, Immedia movies that require everyone who views the content to install a browser plug-in? In operation, QID is simple, too. Installation requires an existing copy of QuarkXPress 7, either the standard or Passport edition, but after that, it's plain sailing. When you open XPress for the first time after installation is complete, you won't notice anything new at first. However, on closer inspection, there's a new kind of layout, 'Interactive', a new Interactive palette available, as well as several minor new menu options. The Interactive palette is the real key to QID, since it contains almost all the tools this app has to offer. All you have to do is select an object in an Interactive layout, give it a name in the palette, then choose what 'action' to make it do (and when to make it do it) using one of the pull-down menus or one of the other various tabs in the palette. There's the usual range of event options to trigger actions, such as double-clicks, mouse-overs and mouse-outs, and using the Script options, you can string together multiple actions into a single response to these events. You can also arrange for actions to occur as soon as the finished project displays, in response to key presses or when the user exits the project. And you can customise the cursors used by the project as well. As you'd expect from something that offers Flash design capabilities, the number of actions you can get an object to do is quite large - over 100 in fact. These range from simple image-swaps to video display, from text transformation to playing sounds. The good thing - and indeed the main selling point of this program - is that you don't have to write a single line of ActionScript, Flash's programming language, or use Flash's timeline to orchestrate the actions. Getting to grips with QID is actually surprisingly easy and you can get pretty far with just a little experimentation - all without recourse to the manual. If you've had any experience of web design, particularly of packages such as Adobe's Dreamweaver and GoLive, it should come pretty quickly. That's not to say you'll get the most out of it, since there are many little options tucked away, such as image sequences and buttons that need a study of the manual to fathom out. But an experienced XPress user can put together relatively simple interactive designs using QID in just a small amount of time.The biggest obstacle to this, in fact, is the user's own thought processes, rather than QID itself. To a developer, it's obvious that you'd need to code what happens when you mouse away from an object if it's changed in response to a mouse-over; to the regular user, that's not entirely obvious, and to the print designer who's never done anything interactive before, it's a learning curve that will initially inhibit ambition. This is something you'd think Quark would either have made clearer in the interface, or anticipated as a default requirement and coded accordingly. As a coding tool, QuarkXPress 7 with QID is surprisingly versatile. With the composition zones in XPress, for example, it's possible for multiple designers to work simultaneously on the layouts, whether that's the interactive version, the web version or the print version. You can also use the image-editing tools and all other layout features in XPress, making this a far more versatile design creation tool than Flash. But it's no real competitor to Flash - something Quark itself admits. While getting rid of the timeline makes it easier for users to create projects and to learn how to use the program, it also makes it impossible to create complicated Flash movies. The lack of ActionScript et al also make it less powerful. With a program like QID, however, the make-or-break point is the output. You can include the interactive content as Flash movies in the web pages that XPress can export or you can export them as pure SWF movies. These can be created at any point using the Preview option, so you know how the project is progressing. The SWF option also allows you to export the movie with an embedded Flash projector for either OS X or Windows. Slightly disappointingly, if you embed videos, these can only be exported in Flash 6 or 7 format, not Flash 8, and they'll be exported as separate files, not kept within the main SWF file. The Mac projector is a PowerPC, not a universal binary application, too. Equally, the HTML can't be tweaked within XPress (only after export). But these are minor niggles. At the current pricing of £82 (until April 2007), QID isn't even a third of Flash's price tag yet it's still pretty powerful. It's easy to learn and to use, although you'll need to think differently to get to grips with the concepts of interactivity. There are a few kinks in it, something to be expected in a 1.0 release, but for anyone who knows QuarkXPress, could never get to grips with Flash and doesn't want to be a coder, QID could be just the program you're looking for.